English Setter was bred in England more than 400 years ago. Spaniels, the Spanish Pointer, and other breeds were used in the creation of this breed. The name setter derives from the dogs’ habit of crouching (or setting) after finding birds so that the nets used to capture the birds could be thrown without the dogs getting in the way. Once firearms were used for hunting, the dogs were bred to stand upright rather than crouch. 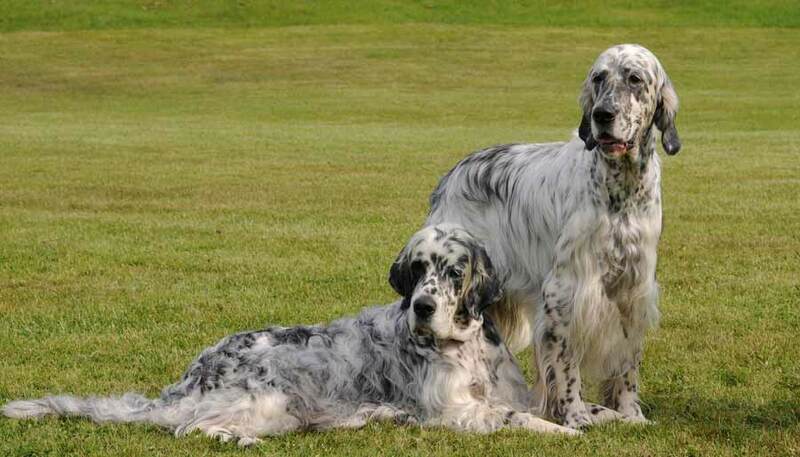 There are two types of English Setters — the show dog and the Llewellin (or field) type English Setter — although there is only one breed standard. (The show dogs tend to be larger.) The English Setter standard calls for a dog standing 24 to 25 inches tall. These dogs usually weigh between 50 and 70 pounds, have a long head with dropped ears, and a long tail. The coat is straight, and the ears, legs, belly, and tail are feathered. The coat is white with speckles of color, including orange, blue, lemon, and liver. The English Setter’s lovely coat needs brushing and combing at least twice a week to keep it looking nice and to prevent mats from forming. They do need a considerable amount of exercise to keep both body and mind in shape. The natural exuberance of a young English Setter can make him difficult to live with if he is confined without enough exercise. All exercise should be on leash or within a fenced-in area. Training the English Setter is also very important. It establishes a bond between you and your English Setter and makes him a joy in your home and community. This dog breed needs an active owner who enjoys hunting, jogging, agility training, or some other active canine sport. Although most English Setter puppies are pretty rowdy and need supervision around young children, the breed is good with kids. English Setters are usually good with other dogs. Health concerns include deafness, allergies, and hip and elbow dysplasia. Share your English Setter story. Note: Upload only English Setter picture or your picture with English Setter below - spammer's ip may be blocked. The original field/hunting type (sometimes called the “Llewellin Setter”) is smaller, with a broader, natural-looking head and much less hair. These dogs have strong hunting instincts and need vigorous exercise. The “bench” or “show” type of English Setter is quite tall, with a long narrow head and a profusion of silky hair that needs plenty of brushing and trimming. These dogs are more laid-back than field lines and are content with long daily walks and occasional running and fetching games. English Setters have an obstinate streak that takes the form of resistance rather than wild disobedience. If pushed too hard, they’ll simply brace their legs and refuse to walk. You must be persistent, but never heavy-handed.